A Pair Of M&s Linen Trousers With Belt Medium Length. Condition is Used. Dispatched with Royal Mail Signed For® 2nd Class. Thigh - 28". Inside Leg - 30". Hem - 22". Front Rise - 12". MARKS AND SPENCER NAVY BLUE LINEN BLEND TROUSERS. SIZE 24 REGULAR. ELASTICATED BACK OF WAISTBAND. Ladies Size 20 Linen blend pants from Marks and Spencer imd a classy Taupe colour. Worn a few times but have loads of life left in them. Im having a clearout and dont need these so they are looking for a new home. Washed and ready to go, from a clean smoke free home. Classic Summer fashion thats versatile as well as good looking and comfy to wear. Inside leg 25" Waist 21"
Ladies cropped trousers size 18. Condition is Used. Dispatched with Royal Mail 2nd Class. M&S Cropped 3/4 Pure Linen Trousers - Size 18 White. Half elasticated waist Condition is used. M&S Size 18 Short White Pure Linen Wide Leg belted trousers Bnwt. Zip and button front fastening, pockets front and back, sash tie belt , great for winter sun or next summer or even as lounge pants because they’re light and roomy. Measures 28” inside leg plus 37” around the waist. Stone Beige High Rise Linen Mix Wide Leg Trousers. linen /viscose. h igh rise. 2 9” Inside leg. Size 20 Regular. 2 0” Across waist. f rint pockets. BNWT Black Trousers from Marks and Spencer. - piped ticket pocket on front yoke. - Linen Mix. - Wide leg. Inside leg 31”. Waist 22” flat. M & S Ladies Trousers Size 20 Regular White Linen Wide Leg BNWT. Condition is New with tags. Dispatched with Royal Mail 2nd Class. The trousers have 2 front pockets and two back pockets and a tie belt. Postage covers delivery within the UK only. Thanks for looking! These trousers have been taken up and the inside leg length is approx 28". Size 20 Linen Mix 3/4 Trousers From M&S. Bnwts. Condition is New with tags. Linen rich white trousers. Marks and Spencer Pure Linen Wide Leg Black Beach Trousers Size 18. Condition is New with tags. Dispatched with Royal Mail 1st Class. Ladies M&S white 3/4 linen trousers size 18 with 2 hook & bar fasteners & zip. 2 pockets to front & 2 faux pockets to back. Lightweight linen is a cool choice. Relaxed through the hip and thigh with a wider leg opening.". Pure linen. Length: Regular. A lovely pair of this season's linen trousers from M&S size 18. Very lightweight, pleats at front waist, slit pockets at back, separate tie belt. Lovley quality navy and white stripe linen mix wide leg high rise trousers. They have front zip and 2 concealed clasp fasten on a flat front waistband, the back is elasticated in "paper bag" styling. womens M&S white linen summer trousers uk20. Condition is Used. Dispatched with Royal Mail 2nd Class. I HAVE LISTED THEM AS SIZE 22 BECAUSE THE WAIST IS 42". THE LABEL STATES SIZE 20, THIS IS INCORRECT. Inside leg 30". The colour is White. Sits on the waist. Elasticated waist at the back. M&S Black linen and viscose trousers. 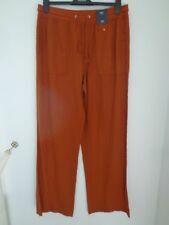 BNWT M&S Women's LINEN MIX TROUSERS / Jeans size UK 18 Long - NEW and PERFECT! The jeans are a size U.K 18, Long Leg with an elasticated waist and tie front. M&S COLLECTION Women's Linen Rich Wide Leg Trousers NEW!!! WHITE LINEN TROUSERS. MARKS AND SPENCER. SIZE 20 REGULAR. Da rk g re en a nk le l en gt h.
SOFT WHITE PURE LINEN WIDE LEG TROUSERS. LADIES MARKS AND SPENCER COLLECTION. 100% FLAX LINEN. SIZE 18 REGULAR. WAISTBAND 97% COTTON 3% ELASTANE. Item: M&S White Linen Long Shorts Size 18. Condition: vgc. Size UK 18S. New M&S Wide Leg 100% Linen Palazzo Trousers. 100% Linen. Inside leg 27". Bottom of leg 11.5". Colour beige. Waistband 19" across the top. M&S COLLECTION Women's Pure Linen Wide Leg Trousers NEW! !